Raize 3GP Video Converter is very easy to use, In addition, the intuitive interface makes Raize 3GP Video Converter the perfect tool for both new and experienced users. It gives advanced users the ability to finish the drag-drop to load or add video files for converting! Raize 3GP Video Converter converts all mobile phone video formats, such 3GP, 3G2, or MPEG-4. 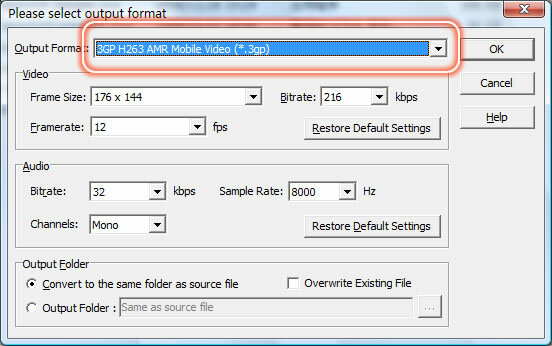 Many settings are adjustable in Raize 3GP Video Converter, for example, you can adjust video size, bit rate, or frame rate, etc... So that the output 3GP or 3G2 video will be matched for most mobile phone or PDA. Raize 3GP Video Converter supports drag-drop to load video files, just drag the video files to the icon or main window of Raize 3GP Video Converter, the conversion will be started automatically. Friendly interface, detailed help document. Even a new user, you can use Raize 3GP Video Converter within a few minutes without any special learning. Raize 3GP Converter allows you to convert AVI to 3GP, MPEG to 3GP. It supports DivX, XviD, MOV, QT, 3GP, RM, WMV, VOB to 3GP format as well. Raize 3GP Video Converter allows you to convert AVI to 3G2 , MPEG to 3G2. You can also convert DivX, XviD, MOV, QT, 3GP, RM, WMV, VOB to 3GP or 3G2 format with Raize 3GP Video Converter. Raize 3GP Converter allows you to convert AVI to MP4, MPEG to MP4. It supports DivX, XviD, MOV, QT, 3GP, RM, WMV, VOB to MP4 format as well. With Raize 3GP Converter, you can also convert MP4, or other popular video to DivX format. If you want to convert your video to MPEG format, Raize 3GP Converter can help you. It supports both MPEG-1/VCD, MPEG-2/DVD/SVCD formats. Raize 3GP Video Converter allows you to extract audio track from video, and convert video to MP3 audio format. AVI to MP3, MPEG to MP3, MOV to MP3.